This paper explores the changes in land prices after 12 years of The Aceh Tsunami in North Sumatra, the largest island of Indonesia. Land prices in 2004 to 2016 were studied in different locations. This Aceh tsunami is one of the deadliest natural disaster in the world where over 200,000 people died. Ten different locations in the area were visited in order to examine property values. In details, six locations in Banda Aceh were focused on in order to make an assessment of changes in land prices. Surprisingly, over the period 2004 to 2016, land prices in Banda Aceh have increased by a factor of 4.87 times or at an average annual rate of about 14.1% per annum. This implies a fundamental rule of real estate value where prices will be increased over time. Some other implication can be found from this field survey. On December 26, 2004 the Aceh tsunami killed over 200,000 people and destroyed billions of dollars worth of properties. Let us examine property prices today in Aceh, 12 years after the tsunami catastrophe (2004 to 2016). This would be a good case study on the matter of natural disaster and land prices. There might be other natural disasters such as earthquake, storm and the like. The tsunami which ravaged Aceh was one of the world's deadliest natural disasters and the US Geological Survey found that a total of 227,898 people died as a result of the tsunami; 170,000 of the dead were found in Indonesia, particularly in Aceh. However the government of Indonesia has estimated total deaths to be as many as 220,000 in Indonesia alone. Based on available evidence it is likely that the total number of fatalities lies between 230,000 and 280,000 persons. The tsunami struck at 00:58:53 UTC, or at 8:59 AM local Aceh time; the epicentre was off the west coast of Sumatra in the province of Aceh, close to the capital city of the province, Banda Aceh. The shock had a moment magnitude of 9.1 to 9.3. The ensuing wave which wiped out Banda Aceh was as high as 30 metres; most buildings in the area were destroyed, leaving mainly bare land. In the aftermath of the tsunami people generally were in a state of shock, desperate and pessimistic about the future. Looking at the situation from a property point of view, most of the land in the area with no buildings, all with debris or partly demolished buildings, would have had zero or even negative value. We have the opportunity today to compare the land value situation prior to the tsunami to the current state of the market. This will be a key step in understanding the nature of the real estate market and provide a realistic assessment of the impact of the phenomenon. 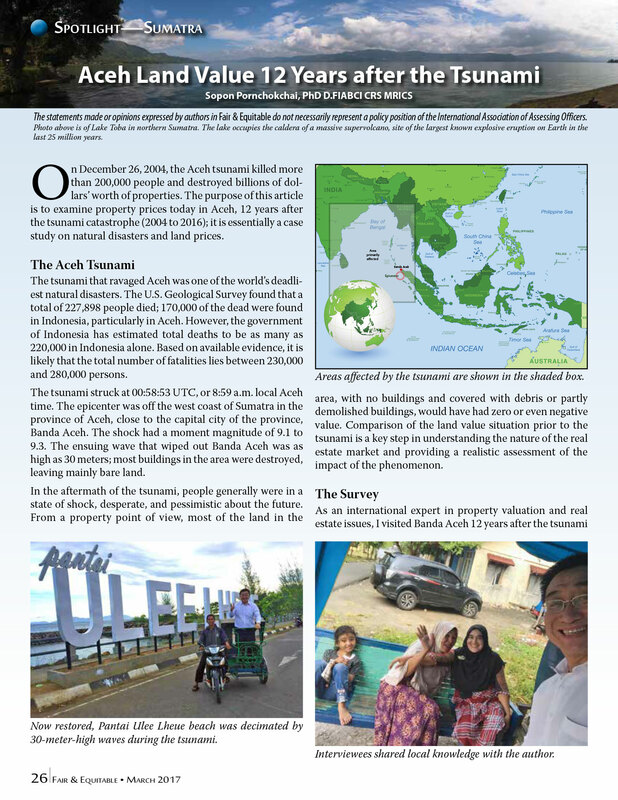 Dr.Pornchokchai, who is an international expert in property valuation and real estate issues, visited Banda Aceh 12 years after the tsunami and explored land prices in 10 different locations in the area. He also visited various relocation sites in order to examine property values in those areas as well. As a result of this examination six locations in Banda Aceh were focused on in order to make an assessment of changes in land prices. This exploration was carried out during August 2016 with significant assistance from the Aceh REI, which is the Aceh Branch of the Real Estate Association of Indonesia. The six sites selected in Banda Aceh include Lampulo where a small boat is still located on top of a house which has now become a museum, PLTD Apung where a ship of 2600 tonnes was washed in land around 2.4 km from the beach, Jalan Profesor Dokter Ibrahim and Jalan Roma Setia (two major roads), Masjid Baiturrahim Ulee Lheue which was a large building that survived the destruction, and the Hotel Grand Permata Hati where Dr Pornchookchai stayed during his visit. In considering changes in property prices, it is noted that there are no property price records either before or after the tsunami. Dr.Pornchokchai, accompanied by an interpreter, visited around 20 sites and was able to undertake reliable interviews at around 10 sites, six of which were in Banda Aceh itself. Local leaders and other persons were interviewed to obtain their recollections of land prices in these areas in 2004, prior to the tsunami, and also their opinions regarding prices in later years. Chronological changes in prices in years for which no reliable information was available were estimated by using compound interest rates applied to estimates for periods before and after the missing information. In assessing the changes in Banda Aceh as a whole, the average increase over all the selected sites was calculated, thus providing a good overview of overall changes in price level. This information can also be used to assess any depreciation in price that might be attributable to the tsunami. Surprisingly, over the period 2004 to 2016, land prices in Banda Aceh have increased by a factor of 4.87 times or at an average annual rate of about 14.1% per annum. It can be observed that land prices appear to have been stagnant only in the first year after the tsunami. Generally across all the areas examined, the increases in price levels are more or less the same, some 4.5 to five times during the past 12 years. Only in the area of PLTD Apung, where the big ship was washed up, was the highest increase of 6.5 times. This is most likely because the area has become a major tourist attraction, allowing a lot of commercial opportunities to be established. It is worthwhile to compare these increases with other similar locations. According to the Agency for Real Estate Affairs which is one of the largest real estate information centres in the ASEAN region, per cat has experienced an increase in value between 2004 and 2016 of about five times or 14.4% per annum. Per cat, with over 10 million tourists each year, has experienced only a slightly larger increase in comparison to Aceh. In addition, Siam Square in the Bangkok CBD, has experienced an increase of 4.1 times or about 12.5% per annum. It is important to understand what has contributed to the substantial increase in land prices in Aceh despite the catastrophe of the tsunami in 2004. 1. Firstly, Banda Aceh is the capital of Aceh Province, and it is the gateway for maritime trade to Indonesia. 2. Secondly, billions of dollars worth of aid were poured into this city following the tsunami. 3. Thirdly massive improvements and new infrastructures were developed in the years following the tsunami. 4. Fourthly, the area has attracted very many tourists and visitors wanting to visit these areas of historical significance. 5. Fifthly, the previously existing insurgency and fragmentation of Aceh communities were disrupted by the tsunami, leading to more harmony within the community. It is considered that these factors have contributed significantly to the substantial increase in land prices. An important factor which should be considered is that of superstition which could make people feel reluctant to live in an area where hundreds of thousands have perished in such a horrifying way. However it has been observed that most people did not leave the city area or even their small villages, but stayed to rebuild. In the case of the hotel where Dr.Pornchokchai stayed for a few nights, this building was formally a hospital. On the day of the tragedy many people fled to the hospital and around 400 persons died there. Now that it has been renovated and converted to a good standard hotel, the land price for this property has increased considerably. Consequently one thing that these circumstances teach us is that, in relation to commercial properties, values will not be significantly affected by mass deaths in the long run. The Hotel Grand Permata Hati was able to be renovated from an old hospital and, as observed is operating very well. There has been a noticeable positive effect on increasing land prices around the hotel as well. The activities of this hotel have contributed to greater development potential in the general surroundings. In summary this exploration of the impact of the tsunami suggests that land prices are not likely to depreciate following a catastrophe in the long run. This appears to be a general rule that applies in relation to real estate prices. This observation has been confirmed in the case of the Kobe earthquake in 1995, Hurricane Katrina in Louisiana in 2005 and the Suchuan earthquake in 2008. However, every rule has exceptions: take for example the destruction of Pompeii in 79 A.D. where the whole city was buried; or the Chernobyl disaster in 1986 where high levels of radioactivity still exist. We could can include that continuing pollution of areas following a disaster would contribute to decreases in value. One question we should try to address is: what if there had been no tsunami? 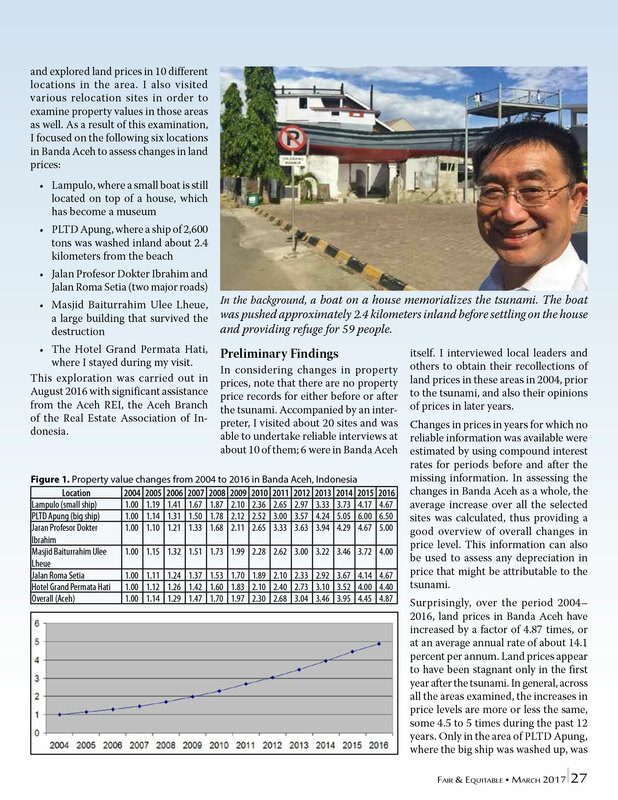 Would land prices have increased at the same rate in Banda Aceh. Dr.Pornchokchai is of the opinion that the area would have experienced only a small, modest rate of increase compared with what has been experienced; overall there would have been less stimulus for the level of activity that exists today. Accordingly one could conclude that the tsunami created many new opportunities for Banda Aceh. Balanced against this however is the modest loss of the lives of hundreds of thousands of people and this is a tragedy for mankind. Dr.Pornchokchai is an IAAO member since 1998. He teaches in the real estate field in many institutions. He is also an experienced property valuer and an established research in relation to property in the ASEAN region, in Africa and the subcontinent. At present he is the president of the Agency for Real Estate Affairs which is one of the largest real estate information services in the ASEAN region.